This Tuesday, February 5, we commemorate the 28th anniversary of the death of Pedro Arrupe, SJ. On this occasion, Rome will receive the cause for beatification and canonization of this former Superior General of the Society of Jesus who is now Servant of God. Not so well known by the general public, Pedro Arrupe was nevertheless a key figure of the last century. Born on October 14, 1907 in the lands of the great Saint Ignatius (Bilbao, Vizcaya, Spain), Pedro Arrupe then went to Madrid to study medicine (1922 – 1926). During his studies, he was asked to participate in an investigation into a miraculous cure in Lourdes. This experience will profoundly affect his personal reflection on religious matters and shape the rest of his life. He entered the Spanish novitiate of the Society of Jesus in 1927. The civil war and the expulsion of the Jesuits from Spain by the republican government forced him to leave the capital to continue his studies in Belgium (philosophy) and the Netherlands (theology). The hall for medical students at the Belgian Jesuit University of Namur, which bears his name, welcomes this remarkable passage. Ordained a priest in 1936 in New York City, USA, where he was chaplain to the Spanish-speaking people in prison, he then went to complete his training in Kansas City, the largest city in Missouri. This state is very much linked to Jesuit history, since it was from Saint-Louis, the state’s second largest city, that the Belgian Jesuit missionary Pieter-Jan De Smet set off in the footsteps of Lewis and Clark to meet the Indians of North America. Like the latter, Pedro Arrupe was burning with an ardent desire to be sent on a mission. Later, he became provincial superior of the Jesuits of Japan. After 27 years of mission in the Empire of the Rising Sun, he was elected on May 22, 1965, the 28th Superior General of the Society of Jesus by the 31st Congregation gathered after the death of the Belgian Jean-Baptiste Janssens. According to his biographer, Jean-Yves Calvez, Pedro Arrupe was one of the actors of the spirit of the Second Vatican Council and a spiritual leader of his time. He was obviously well prepared, since he spoke several languages and possessed the art of entering into a mentality and culture different from his own. Pedro Arrupe, a follower of the Council’s conclusions, infuses the Company with a resolutely more modern spirit. Convinced that the latter, in its traditional concern to influence the socio-political elites, had engaged too exclusively with the rich and ruling classes, he was frequently in opposition to the conservative elements of the Church and its hierarchy. Commitment to faith and justice is the decisive way, in the eyes of Father Arrupe, by which the Society fulfills the mission entrusted to it by Pope Paul VI, to oppose atheism. “This is not a matter of a particular apostolate, reserved for a few specialists, but it is a dimension common to all the apostolic tasks of the Society. “To know how to discover realities that for many are new and to find a language about God that has nothing conventional, stereotypical or anachronistic, that joins the very experience of the unbelieving or unbelieving man, that tells him something at the level of his most intimate questions”. In short, “to sink progressively” into almost unexplored territory. Seeing that it is in Latin America that the situation is deteriorating most rapidly, both because these peoples were hungry (as much justice as bread), and because they were corrupted by Marxism, Pedro Arrupe wrote in 1979: “We would cease to be true sons of Saint Ignatius if we did not do everything in our power to respond to this clamor. Through evangelization we can provide a marked, effective service, but it will also attract great opposition, even persecution, perhaps from where we least expected it.” This is reflected in a concept dear to Father Arrupe: enculturation. “Enculturation is the embodiment of Christian life and message in a concrete cultural area, so that this experience transforms and recreates that culture. Enculturation is thus at the origin of a new creation.” It is in this drive to fight for faith and justice as close as possible to reality that he created the “Jesuit Refugee Service” (JRS), because, he said, “stripped of everything and everyone, refugees are the poorest among the poors”. It is in the same way that six Jesuits were murdered in El Salvador in 1989 by an army commando. Misunderstood and often accused of naive optimism by the Roman Curia, Pedro Arrupe was almost publicly disavowed a few years later by Pope John Paul II. In 1983, he was struck by a thrombosis that let him aphasic and paralyzed. It is at this moment that the Pope suspended the right of the Society, cancelled the appointment of Vincent O’Keefe as Vicar General and appointed in his place a personal delegate with full powers, Paolo Dezza, whose mission was to put the Society in order, suspected by him of being too close to the theology of liberation. 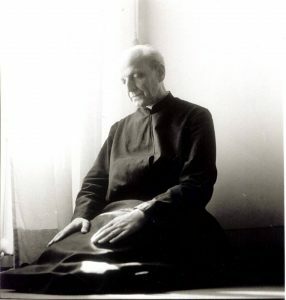 Although Pedro Arrupe was an integral part of a certain ecclesiastical elite, which would serve him in terms of the popular devotion necessary for canonization, he was nevertheless recognized by all as an advocate of faith and justice among the most disadvantaged. On the 28th anniversary of his death, the Society of Jesus wishes to pay tribute to its 28th Superior General by introducing a cause for beatification and canonization on Tuesday, February 5 in Rome, within the walls of the Lateran Apostolic Palace. The event, announced on January 30 by the current Superior General, Venezuelan Arturo Sosa, SJ, began at 4pm with a thanksgiving Eucharist. The Superior General called on all Jesuits to go to this opening session as much as possible. The Vicar General of the Pope for the Roman Diocese, Cardinal Angelo De Donatis, presided over the ceremony. To remain in communion with this event, the Spanish Father Pascual Cebollada, SJ, postulator of the cause of Father Arrupe, invited all the Jesuit communities to celebrate the Eucharist on the same day, at times convenient to them, “as a thanksgiving for the life of the former Superior General on the 28th anniversary of his death (…) The whole Society of Jesus will be in prayer union on the occasion of the official opening of the procedure for his beatification cause.” Pope Francis is very willing to receive this cause, having himself quoted Pedro Arrupe as recently as the last World Youth Day (WYD) and seemingly determined to bet on his beatification.